“I want to help. But where do I start?” Since her season as a judge on Oprah Winfrey’s “Big Give,” humanitarian campaigner and fundraiser Malaak Compton-Rock gets asked this question a dozen times a day. Now in a new book, she shares her inspiring story and shows others how to create their own path to community service. Malaak offers an uplifting chronicle of her “journey for change” and demonstrates to readers how and why they should embark on their own. Part memoir, part practical guide, global humanitarian (and wife of Chris Rock) Malaak gives readers insightful advice including how to find the right volunteer opportunity, how to get kids involved in a life of service, how to research charities, and how to start a nonprofit, as she did several years ago. Her practical wisdom is grounded in inspirational anecdotes about her own experience with service, including her work with Hurricane Katrina aftermath, the two nonprofits she has helped launch, and her recent powerful initiative called “Journey for Change: Empowering Youth Through Global Service,” which provides travel, service, and advocacy programming for thirty at-risk kids from Bushwick, Brooklyn, including a two week mission to South Africa to participate in service projects. IF IT TAKES A VILLAGE, BUILD ONE also features interviews with other well known humanitarians, like PR powerhouse Terrie M. Williams, activist Bobby Shriver, and journalist Soledad O'Brien, as well as engaging sidebars with advice and facts about service. 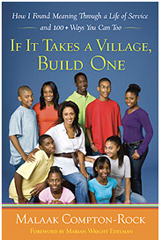 Warm, honest, and accessible, IF IT TAKES A VILLAGE, BUILD ONE is a hopeful reminder of all of the ways in which we can volunteer, donate, and become conscious givers in today’s society. A must-have book for anyone who has ever wanted to make a difference in the world. Teaching children the meaning of service can be the greatest gift any parent can give. Watch as Malaak Compton-Rock works with her daughters to make their community a better place. Click here to see video. Read more about Malaak's favorite "Gifts that Give Back". In this interview with Al Roker, Malaak Compton-Rock explains how she got started in a life of service and volunteering. Click here to see videos. Susan Fales-Hill interviews activist Malaak Compton-Rock about her new book and how we can all step up and help others. Click here to read the article. Malaak Compton-Rock reads a selection from the Introduction to If It Takes a Village, Build One at a book reading and signing at the 14th and 5th, New York city location of Busboys and Poets. "As far back as I can remember, I’ve been engaged in some kind of service, activism, or volunteer activity, and that without a doubt is thanks to my mother, Gayle Fleming. My mother is an activist from way back—she must have gotten her interest in politics and world events from her mother, who was a voracious reader and writer, and she clearly decided to pass both an interest in politics and a commitment to service down to me..."
Click here to read the rest of the exerpt from Chapter 1. For each copy of the book purchased from April 6th - July 6th, 2010, Malaak will donate $1 to The Global Fund. Read more about Malaak's support of Product (RED) and the Global Fund.